This is the time of the year when you can taste the paradis in the winery, this French word meaning "paradise" or "heaven". The paradis is the freshly-pressed juice flowing from the press after a couple of weeks of carbonic maceration. This juice of gamay is very different from what it would have been if it hadn't beforehand spent 15 days of forced seclusion within the intact skins of the grapes, in a strong fermentation pressure kept in check by a natural production of CO2. It didn't get its name for nothing, and even for a non-expert juice taster, this is paradise on earth. This paradis has a strong-enough evocative power to have inspired a few village celebrations throughout the Beaujolais, for example the Paradis et Artisanat day in Arnas, and the Fête du Paradis in Odenas. The grape juice will fill the glasses during these festive events, a juice which already has a small percentage of alcohol, maybe 3 or 4 % when you have it just at the press, a bit more later, and it makes you feel high in a very gentle way after a few refills, which are hard to resist. The paradis is a close parent to the delicious bernache or vin nouveau, other names found elsewhere in France for the same sweet grape juice turning slowly into wine. I love to visit wineries at this time of the year and have a few glasses of this savoury fermenting juice, usually a beverage with a lightly more alcohol but still so beautifully sweet. But filling your glass under the press at Domaine Lapierre is not usual for me, and I enjoyed every sip, well aware of the importance of this moment. There was this glass sitting empty on the base of the press and I guess that Mathieu, Camille or one of the cellar guys would use it to check the juice and have a foretaste of the vintage, for this particular parcel at least. Link to video on which Mathieu, then Guillaume taste routinely the press juice. Filling the press I had called Mathieu long before visiting the winery at this crucial period, knowing that this is not the easiest time window to receive visitors, but I wanted to witness this bustling time when macerated grapes begin to be unloaded and yet other parcels are still in the process to be picked, grapes keeping arriving in the chai. With macerations lasting often 15 days or more, you still have the chance to see at the same time a devatting and the last pickings in parcels that needed a bit more time to ripen. I thought I'd see also Claire Richaud who is a former sommeilère with an impressive family background in the Rhône and who is training here alongside her wine courses in the wine school, but she was on a sick leave that day. When I walked in on this saturday morning, there was a lot of activity there, Camille (Mathieu's sister) was organizing things in the vat room while Mathieu himself was in the bottom of a wooden fermenter (the one on the right) busy emptying the whole-clustered grapes with a fork. Anne (dressed in white), also a sister of Mathieu was there too, as well as another young woman, Chloé who was training here for one month (in a purple anorak on the video). Someone was working in the bottom of the wooden fermenter on the right of this picture to fork out the grapes, guess who ? Mathieu Lapierre at work I had figured out that cellar workers would be doing this job in a winery the size of Domaine Lapierre (16 hectares), but Mathieu himself was painstakingly forking out the grapes. The big hose on the left is not there to pump the grapes out, but to take the lethal CO2 out, which in return brings breathable air inside. There are still accidents throughout France with workers falling dead in a vat because they breathed CO2 and when this happens, there is sadly little to do, that's why precautionary measures are important. You can see here that even though Mathieu is now unloading the bottom part of the vat, the grapes are still whole-clustered and mostly intact. On the outside of this wooden fermenter, I could read the words "Morgon Py 33,42 hectolitres". Not the lowest cuvée, here. Jean-Yves levelling the grapes in the press The basket press is almost full and Jean-Yves makes sure that the grapes are spread out evenly all over the surface while Mathieu Lapierre forks out the last clusters from the vat. The grape load in the wooden fermenter will coincide perfectly with the press volume after a careful smoothening of the surface. Even before the press has been put in motion, the juice has begun to flow underneath, filling slowly the intermediary tank where you can drop your glass to taste the paradis. Video on the work Here you can see Mathieu forking out the grapes and filling the basket press. There's an interuption though as the pitch fork breaks down, either because these winery tools are not strong enough, or Mathieu is really working hard. His sister Camille brings him another one, but if I remember, this one will also fail and need some repair. Sorry for the pitch-fork manufacturer but they need to review their fourche à raisin, like you call them in French. You can see in the background another wooden maceration vat being emptied onto the forklift bin. Putting the lids on the press Mathieu Lapierre has taken out all the grapes and the press is almost ready. Jean-Yves and guillaume put in place the two wooden lids and the upper part of the press will go down slowly with the screw, flushing more juice out of the still-intact grapes. This type of basket press is still used throughout France, often in wineries favoring traditional winemaking. They are widely available and cost little money, as many sit idle in outbuildings of farms that stopped making wine or opted for more modern presses. Such a vertical press has an unlimited lifespan, you only virtually have to change the wooden slats when you find one because they're often stored in the open or the wood is too damages, but with new wood you get a brand new press. Claude Courtois in the Loire (Sologne) for example recovered a dozen of them in his region, 8 of them being fully operational now and the others being stored for later renovation. But you can also notice that these old vertical presses are mounted on a stainless-steel base that probably do a better job in moving the juice in perfect conditions (easier to keep clean). Another fermenter being emptied While Mathieu was getting the last clusters from his fermenter, another wooden vat was being emptied, this time with a forklift because the press was a few meters away. The forklift is also very soft on grapes and they reach the press in pretty good conditions. Here again, you can see the big hose going down to the bottom of the vat to siphon off te CO2 and make the work safer for the guy in the vat. Outside, written with chalk you can read the words "Morgon biodynamie 32,73 hectolitres". While all the surface is farmed organic at Marcel Lapierre, there are a few parcels that are farmed also with biodynamics. The man standing atop a vat at a distance is Mr Ito, the Japanese wine importer. Mr Ito, who imports many French natural wines to Japan, travels regularly to the different wine regions and visits many wineries year around, I remember seeing him also a year ago during Philippe Pacalet's harvest. He takes many pictures which you can find on his website. Pouring a full load of macerated grapes While the other press has begun squeezing its load of grapes, the other, round basket press is being filled with another batch of macerated whole-clustered grapes. The grapes breath out some sort of fog, sign that the fermentation is slowly underway. What impressed me also while looking at the bustling vat room was the importance given to hygiene, with workers regularly wiping the press frame (where they occasionally walk for different tasks) with a cloth or hosing down the cement pavement with lots of water and then pushing the water and dirt outside into the gutter. What makes this visit even more interesting is that as you may know, the Domaine Lapierre is some sort of originator of a very simple winemaking philosophy, considered non-interventionist, without corrections, additives, filtration or fining and even often without SO2. Marcel Lapierre who passed away two years ago initiated in the early 1980s' this work philosophy with the help of his mentor Jules Chauvet. 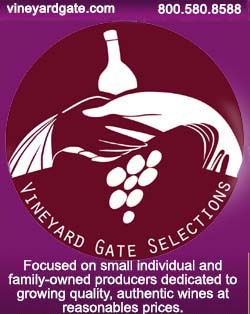 Many wine lovers now consider this winemaking as common sense and a return to real wine as opposed to the bodybuilding wines that appeared in the 80s' due to mass use of new techniques and an ever wider range of additives created by the lab industry. Beaujolaid had become the queen region in the 80s' for these artificially-formatted wines and Lapierre along with a few other winemakers (Jean Foillard, Guy Breton and Jean-Paul Thevenet) are now considered the pioneers in the resurection of Beaujolais. This winemaking which for convenience reasons was much later called "natural wine" required a lot of work in the vineyard though (no more steroids, fertilizers or weedkillers), and certainly more hygiene as the juice-then-wine is not permanently held on leash by repeated SO2 addings, but the result in the wines was definitely what conquered the public. Video On this video you can see this haze coming out of the newly-devatted grapes. Further, you see two workers atop a big fermenter, busy putting back the lid in place, possibly after a pumping over. Camille Lapierre (Mathieu's sister) can be seen coming and going, overlooking the different operations. Anne Lapierre (in white), also a sister of Mathieu and Camille briefly walks in and speaks to Mathieu. The casse-croûte at 10:30am At one point as the two fermenters were emptied and hosed clean, most of us including Mathieu walked to the vineyard in the back of the winery where the pickers were going to have their 10:30 break, not the real lunch that was to come later in more comfortable conditions but the sandwich break, or casse-croûte like we say in French. But believe me, I'd dream to have such a variety of good things for a casual casse-croûte every day, and I had a hard time not returning for more rillettes... I spoke with Idoia (in yellow, center) who has more projects related to wine including travel. Marie (in red), Mathieu's mother, was there helping make sure that everyone got what he/she needed. She offered me a glass of white wine, a delicious treat on top of the food, I didn't do hard work that morning but I could understand how it feels when you're in the middle of a picking morning and you have this half an hour of rest with crunchy bread and charcuterie. Marie Lapierre and her children (Anne, Mathieu & Camille) Marie told me that they want to keep with this tradition of having the pickers take a break in the mid-morning with this hearty food. Some other wineries have discontinued this for economy reasons (as the food is provided by the winery) but here at lapierre they think it's important, especially in days like that when it was so cold in the early morning when the pickers began their work, she says it was 1,5 ° C (34,7 ° F) over there in the vineyard. I knew it was cold that weekend and I had heard of 8 ° C (46 ° F) but this was even colder indeed. She says that the pickers work longer hours in the morning, 5 hours, compared to only 3 hours in the afternoon. They have a break for lunch at 1:30pm. They usually begin at 7:30am in the vineyard but here it was rather 7:45. The harvest had already started close to 3 weeks before, Mathieu Lapierre says that this year they had lots of sorting which slows the picking. You can find along the rows a few crates full of discarded clusters and the parts of the clusters that were cut off because of rot. Mathieu says that they may distill that for the state. He says that after last year where the yields were very low, they were on their toes this year, even earlier in the season, taking extra workers for this or that task, like doing more plowing between the rows to keep the grass in check. That's the challenge of farming organic he says, he's not farming organic for the sake of it but because it allows him to have grapes from which he will be able to make the quality of wines that he is looking for. These wines are called "natural" but beyond that they're terroir wines, the yeast that will make these wines are the expression of the terroirs on which the grapes grew. Mathieu & Camille Lapierre Mathieu Lapierre says that lab yeasts may work on grapes coming from soils with little life of their own, but here with the dynamic life at work in these vineyard, he says that he's not sure lab yeasts would take over, there's a milieu here with a ph, an acidity and other properties, and the indigenous yeasts are already thriving, making it difficult for an outside yeast to compete. But when the harvest is sterile and dead because of the chemical farming (especially with the antifungal), the lab yeast may help. The vineyard where were standing has always been farmed organicly but Mathieu explains how they have to bring plowing progressively on vineyars that they convert from conventional farming to otganic, because the surface roots are so important on vineyards sprayed with herbicides and fertilizers. I also asked Camille about her whereabouts here, and she says that she's been travelling around before coming back in the family estate. She was a sommelière before but she stopped two years ago to get a short training in the Beaune wine school and joined her family here in the winery. She still leaves a few weeks every winter to do the harvest in wineries at the other side of the world, she went for example in Chile (Louis-Antoine Luyt) and also in South Africa, and she also travelled recently to Georgia at Pheasant's Tears where she took part to the harvest and vinification on the skins for 3 to 6 months in buried amphora. Video on the pickers & sorting The pickers were a mix of French and Spaniards, mostly young people. They did a good job at sorting the rotten grapes, cutting the clusters to keep the good stuff. A picker at the end of the row was busy double-checking the sorting to make sure that no rot had slipped through. because the grapes won't be ripe before november. Also, this year they had to harvest case per case, doing sometimes with two separate picks in the same parcel, that was the uneasy part of the vintage, with a more detailed work to adapt the ripening discrepancies. He says that they can afford the work because they sell their wines at a higher price than conventional Beaujolais. On this issue, I say that with a conventional farming turning overnight to organic, maybe the result in the wine wouldn't be immediate, which is maybe why wineries are reluctant to make the step, but Mathieu disagrees, saying that it's almost like when in the kitchen a cook replaced badly-selected ingredients with good ones, the food will immediately improve. But it's a sum of little things and the winegrower has to take care of all of them if he wants to make better wines. On the other hand the prices that the négoce pays wouldn't allow such a costly work in the vineyard, he says, that's why the thermovinification technique is so widespread in the region. He says that this technique, which consists with heating the juice from 50 to 90 ° C (122 to 194 ° F) for 24 hours, erases the terroir completely, you can do that with any gamay from any region and you get almost the same wine everywhere. The goal of thermovinification, he says, is extract color, yield blackcurrant aromas, and sterilize the milieu after which you can add lab yeasts at will. And with the thermo he adds, you could vinify grapes with rot, the technique by the way appeared here in vintages with lots of rot, starting in 2001 and 2002, which were very difficult vintages. The refrigerated trailer on the right is used in case the harvest days are hot, then they put the crates in there a few hours in order to cool them down before the vinification. Mathieu Lapierre in the cask cellar Mathieu Lapierre says that now the fermentations are unfolding correctly but that predictably they're going to slow down with the colder temperatures of autumn, as it also cools down the inside of the buildings and vat room. Speaking of the temperature of the grapes at harvest, Mathieu says that he is not worried to take in grapes at temeratures of 5° C or 10 ° C, then during the carbonic maceration, he just checks that they don't go over 30 ° C otherwise it would translate into rustic expressions in the wine. Usually if he takes the right steps he hasn't to intervene but if there's an undesired temperature spike, he can take some juice in the bottom of the vat and pump it over to cool down the whole. Otherwise he isn't favoring temperature control, he says, because the yeasts have their own dynamic, some working at lower temperatures, some at higher, and messing with the process is tricky. If he prefers not to go over 30 ° C it's just that some enzymatic extraction may take place in the grapes, with undesired consequences, that's all. What they're devatting right now has been through 2 weeks of maceration but with the colder temperature the next batches will stay more like 3 weeks in the maceration vats. Then he isn't worried if after the maceration stage the fermentations take longer because of the cold season, and he even leaves the vats outside. Longer fermentation yields wines that are more complex aromaticly, letting different types of yeast to work their way, and yielding also a richness and a glycerol that wouldn't be there in a fermentation under a controlled, higher temperature. Mathieu & Camille busy filling vinification data Mathieu says that what is tricky when you near the end of the harvest is the fact that you're short in vat volume : With the maceration, if you want to make 100 hectoliters of wine you need a 200-hectoliter volume in fermenters, the whole-custered grapes taking lots of room comparedwith the juice at the end. Right now they have 22 fermenters, and after the maceration the juices are then blended in a vat, then continue quietly their fermentation in barrels stored in the surface cellar, which is temperature controlled if needed. The fermentation milieu must be strong enough so that for the last grams of sugar the bacteria are not a threat. With the long maceration they bring down the acidity and gain in suppleness, but with a higher pH it may be facilitate the bacteria activity, and the malolactic usually gets done very quickly, especially that the malic acid has already been degraded by enzymes during the maceration. They often have the malolactic completed with still sugar in the wine but that's not automaticly worrying, Mathieu says, adding that Jules Chauvet had insisted that in the interaction between yeast and bacteria, it's difficult for outside forces (bacteria) to conquer a territory when the indigenous milieu is strong enough. That's why you don't necessarily need to add SO2 at this stage, it's often sufficient to wait and be patient, SO2 being the last resort (which he'll use if needed). That's in such issues that Mathieu thinks that enologists consulting for wineries are not close enough to the wines, the batches and the parcels, and prefer to apply a recipe where heavy-handed security is the first drive, when a more careful approach could avoid many corrections and additions. Working on a case-per-case basis is the solution, but you have for that to know better the parcel, use indigenous yeast and so on. The intriguing ceiling mural in the vatroom They didn't add SO2 on the incoming grapes, Mathieu says that at this early stage, if you work correctly you don't need to. It will be more arduous after Christmas, when the wines will be in barrels with much less sugar and already higher alcohol, that's when the wine needs to be regularly checked, and if there are worries he can either cool down the wine, stir it to bring up fermentation agents from the lees, or he may top up the barrels with wine from another barrel that fares particularly well, it's case per case. In rare occasions he resorts to add sulfites on the tricky barrel but it's rare, the last time being in 2005 in the Cuvée Marcel Lapierre which was otherwise very good : some of the casks were at 13,6 % in alcohol which is tough for the yeast, and they had to add SO2 on 3 casks (from a total of 20 for the cuvée) after 6 or 7 months of fermentation. Most of the time you don't need to add, there are other ways to accompany the wine and help it go around the hurdles. Mathieu was a cook before coming back to the family winery in 2005, and he says that the cook and kitchen work is a good base for this job. Undesrtanding the chemistry of how to prepare ingredients to make good food is very akin to the competence you need to make wine, you use the same senses, the same instinct. Samely, the cook will smell things and by instinct at one point, he will say it's good and move on. I asked a worker about this impressive ceiling mural in the chai, and he said it was there since the late 70s' or early 80s'. It looks like an alien creature with multiple claws hanging over your head, maybe an allegorical painting representing the elemental forces behind the fermentation... The house, in front of the vat building Mathieu Lapierre says that what's interesting now is that with the many wines that are made differently today (he avoids using the term natural wine), people including the enologists who in the past said that it was impossible to make wine without SO2 or without lab yeast are obliged to pay attention. The other argument of opponents was to say that "it may have been true that in the past, winemakers didn't use these additives, but the wine was awful", which is questionable considering the many lauding poetry and writings in the History dealing with wines and the pleasure to drink them. On the other hand, if there's now an aknowledgement of the non-additive vinification as yielding quality wines, winemakers have nonetheless the duty to be very careful because faulty wines can result from a careless vinification in the name of naturalness. He says that today journalists sometimes write positively on say, a white wine with oxidation aromas and volatile, when in his own opinion a bit of SO2 would have made a good job in this case.